Erin has been with B-Boy Productions, Inc. since 2011. As our only harpist, she fills a niche to help us cover any type of ceremony instrumental request we could possibly receive. 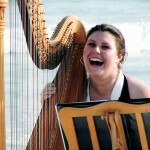 Her soothing sound fits the beach or lawn weddings perfectly. With over 18 years of playing experience, she’s guaranteed to bring a professional touch to each and every event.